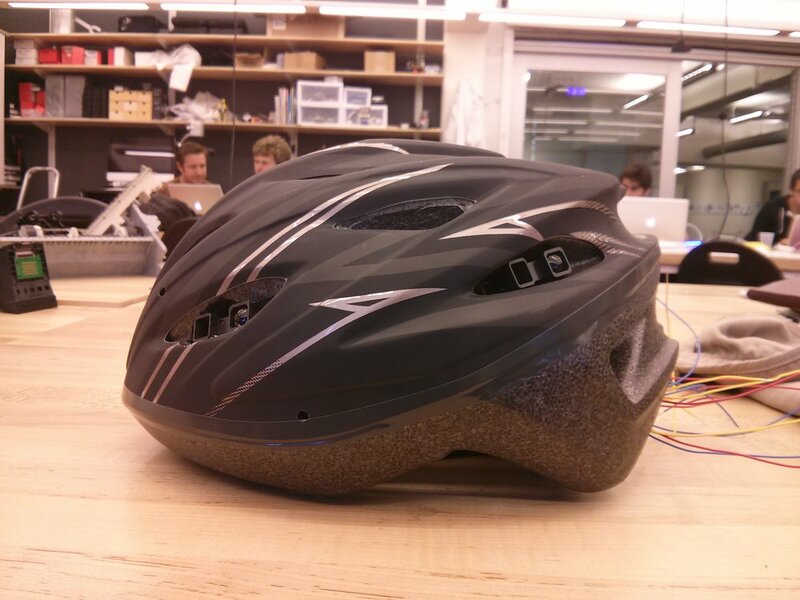 Summary: A helmet and bike system that uses haptic feedback to help bikers stay more aware of their surroundings. Provides city planners useful data about the safety of their city. Intel asked us to think 5-10 years in the future and design a system to aid bikers and city planners using both physical and digital components. Our solution includes three main components: a helmet, an on-bike computer, and a web interface. The helmet and computer provide live feedback to the biker, and record data to give the user feedback via the web app, as well as send city planners warnings for areas with high incident rates. We started the project by interviewing frequent bikers in the area. From their answers we pulled common themes and used them to start creating ideas to solve their needs. Our solution had to incorporate a powerful processor, offer an intuitive and appealing product for bikers, and provide plenty of data-gathering opportunities to help the city better understand what happens on their streets. A large part of my role on the team was to code and create our prototype. I paired IR sensors with vibration motors so that the closer something got to the sensor the more intense the motor would vibrate. Five of these sensor/motor pairs surrounded the helmet, giving the wearer haptic-feedback "vision" as to what entered their immediate surroundings. André and I presented the final prototype at Intel's headquarters in Portland, OR.